New Lunar Rendezvous Queen Sabrina Curran is escorted on a stroll around the San Luis Convention Center Ballroom by King Gene Hollier after being crowded during the 2018 Coronation Ball. She is the daughter of Georgette and Chris Curran of Clear Lake and was sponsored by Christopher Curran Investments, Wells Fargo Advisors. Skylar Jane Slattery, a senior at Clear Springs High and the daughter of Angela and Patrick Slattery was named queen alternate. She was sponsored by Dunn Heat Exchangers, Inc. The new captain is John Wesley Dorman III, who goes by the name, Trey. He is the son of Catherine and Wes Dorman and is also a Clear Lake High senior. Robinette & Company Caterers was his sponsor. After she was crowned, Festival King Gene Hollier took her on a stroll around the ballroom, which was decorated in deep tones of purple, blue, gold and teal, as they crowd roared its approval and then they danced the first dance. 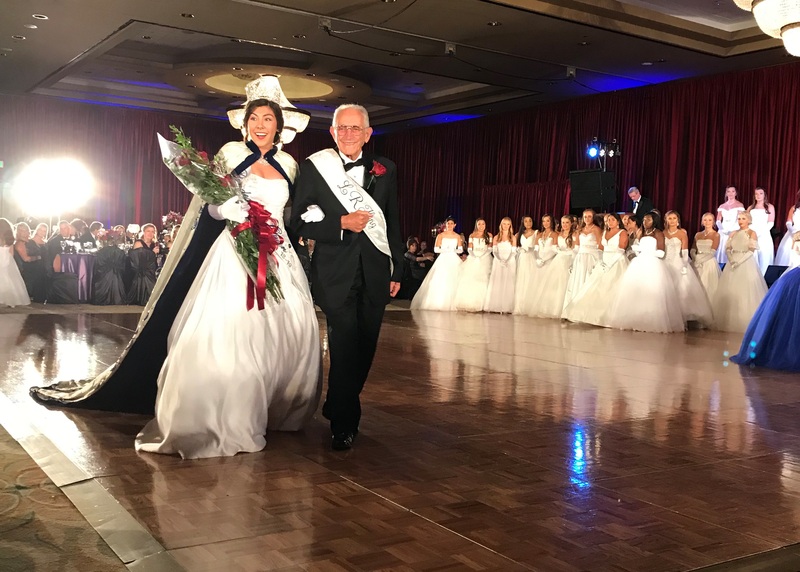 The coronation came after all the princesses, lieutenants and members of the Little Court and their escorts had been introduced by emcee, former astronaut and retired Col. Bill McArthur Jr., who has often served as emcee for the annual event. Ball Chairman Michelle Holland and Co-Chairman Debby Reichert selected an Arabian Nights theme for the event, which is now in its 53rd year.